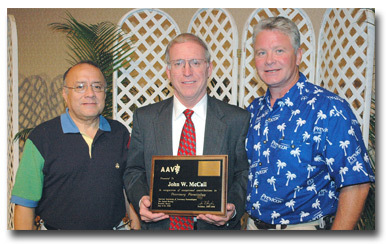 Dr. John W. McCall being presented with the 2006 Distinguished Veterinary Parasitologist Award at the AAVP Annual Meeting (left to right: Dr. Jorge Guerrero, Dr. McCall, Dr. Doug Carithers). Dr. Dan Snyder is AAVP President for 2006-2007 and Dr. Susan Little was elected as Program Chair for next year's meeting in Washington, DC. Heather Stockdale, Auburn University, is the new student representative.